The Orton Effect comes from a technique first used by Michael Orton in which one "normal" photograph or slide was sandwiched with another out of focus and overexposed photograph or slide. The dreamlike quality of the resulting imagery has become very popular. You can see examples of Michael Orton's work at http://www.michaelortonphotography.com and find out about the process he uses to create the effect with a film camera. In today's digital world, the process of creating Orton Effect images has become even simpler using digital darkroom software. In addition to creative uses, the Orton Technique is also very useful in "saving" images that wound up accidentally out of focus. For this tutorial I am using PhotoShop Elements version 6 for Mac. The process is the same for almost all digital darkroom software although some of the menu options may be named differently. Not all images work well with the Orton Effect. Business portraits, technical images, photojournalist images, and images meant to show "harsh" subject matter do not lend themselves well to this process. Images of children, landscapes, and "cute" animals work especially well for this treatment. 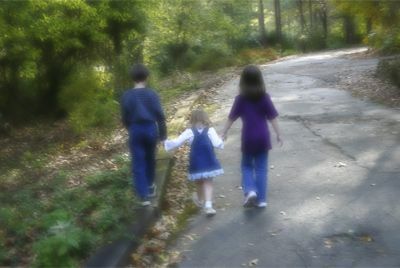 In this case, I've chosen an image of three children walking through a local botanical gardens. Because I was walking while shooting the image is not nearly as sharp as I would like. It is an important memory I would like to save though as the children are my daughter and two children of my childhood best friend. The first step in the process is to create 2 duplicate layers of the original image. Name the top layer "Bright layer" so that it is easier to track what layer you have selected later on. Once you have the two new layers created, click the small eye icon next to the original image to hide that layer. Then select the background copy layer (the new bottom layer) and use the opacity slider to between 60% and 75%. This will intensify the Orton Effect later on. One of the major components of the Orton Effect is the blur of the image. Even if the original image is out of focus, you still need to apply more blur to the image. The best type of blur for this effect is Guasian blur. Make sure "Bright Layer" is selected and then select Gausian Blur from the filter menu. When selecting the amount of blur to apply, there will be some variation based on the image you use. You are looking for a strong blur that hides most details but still allows you to see the shape of the images relatively clearly. For this image I selected 21.4 pixels of blur. Remember that Bright Layer should still be the working layer at this point. After blurring the Bright Layer its time to add the brightness to that layer. Under the Enhance menu, select Brightness/Contrast. This is the point where Bright Layer lives up to its name. With Bright Layer still selected, use the brightness slider to greatly overexpose the image. As with the blur, the amount of brightness will vary based on the original image somewhat. For this image I selected +141 brightness. At this point its time to bring the layers back together and complete our image. With Bright Layer still selected, use the layer blend dropdown box and select multiply. Photo © Liz Masoner, licensed to About.com, Inc.
Congratulations! You've just Ortonized your image! The final image should have a dreamy, fairytale look to it. If the image is too dark, set the opacity of Background Copy layer a bit lower. If you only created one duplicate layer to make adjustments too you will have to go several steps back and up the brightness much more.For those of you who like fewer button clicks you can download and install the Orton Effect Action for Adobe PSE and CS created by our graphics software Guide, Sue Chastain.